49 22-08-2017 Notification of Examination regarding degree/transcript/DMC/Migration Certificate processing fee. 48 23-08-2017 General awareness programm on Dengue Fever and its Protection has been organized on 23rd August, 2017 at 11:00am in Khyber Union Hall. 47 19-08-2017 MPhil / PhD admission open for the Session 2017. 45 27-04-2017 Approved Statute 2016 of Islamia College, Peshawar. 44 06-12-2016 Rechecking / Retotaling notification of MA (Economics, IR, Political Science, English and Arabic) annual exam 2016. 43 30-11-2016 Notification regarding rechecking/ Re-totaling of MA annual examination 2016. 39 23-09-2016 Notification regarding BA Supplementary Exam and B.Ed Workshop. 38 19-09-2016 Notification regarding Submition of research proposal of MS/MPhil students of Computer Science. 37 25-07-2016 Notification regarding Students Parents Coordination Council. 36 06-06-2016 Notification regarding office timing during the Holy month of Ramzan-Ul-Mubarak. 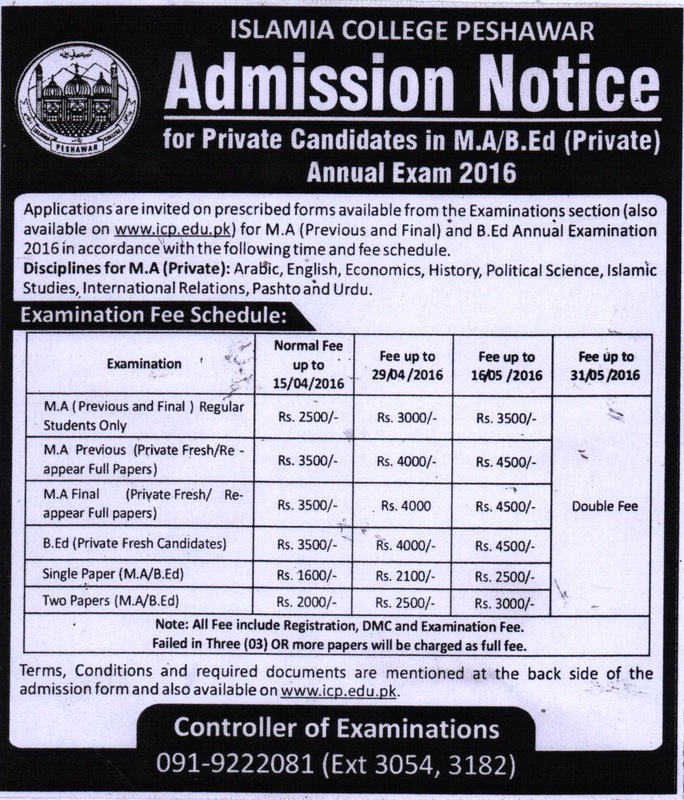 33 22-01-2016 Admission Notice for private candidate in M.A/B.Ed Annual Exam 2016. 32 16-02-2016 Notification regarding repeat paper registration. 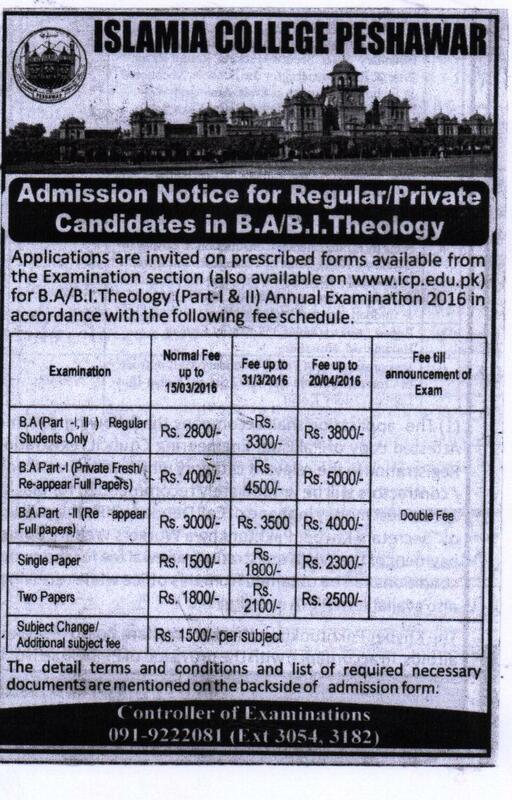 30 08-02-2016 University Model School Peshawar Admission notice for Nursery and K.G. 28 28-01-2016 Notification regarding spring Semester 2016. 27 12-01-2016 Notice regarding student strike, hooting and un-rest on the Campus. 26 11-01-2016 Notification regarding registration of FA/FSc in BISE Peshawar. 24 05-01-2016 Interview for the selection of two student in MS-leading-to-PhD/PhD program in Kyung Hee University, South Korea. 22 25-11-2015 Speech on Violence against Women & Human Rights. 21 10-11-2015 Seminar on Iqbal Day. 20 19-09-2015 Third Convocation of Islamia College, Peshawar will be held in November, 2015. 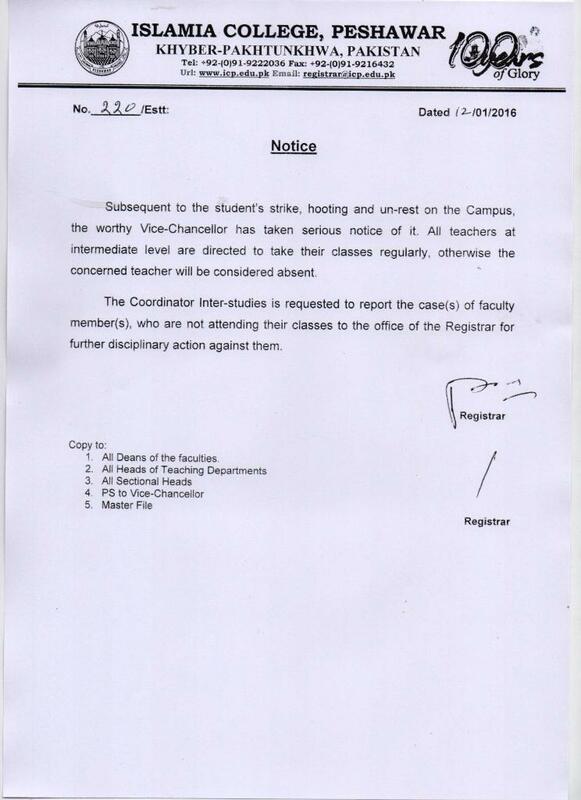 18 07-09-2015 Ban on first year student teasing and fooling. 16 01-09-2015 Governor / Chancellor Stopped / banned, all kind of politically motivated associations/union by the students and employee of the universities. 15 27-08-2015 Decision notification meeting held on 26-08-2015. 7 22-06-2015 Notification of Summer Vacations with effect from 22-06-2015 to 22-08-2015(BDI). 6 16-06-2015 Office timing during the Holy month of “RAMZAN UL MUBARAK”. 5 28-05-2015 Islamia College, Peshawar and its constitute institutes will remain closed on Friday 29 May, 2015. 4 18-05-2015 Memorandum of Understanding between Sejong University, South Korea and Islamia College, Peshawar. 1 08-05-2015 Application for correction in Prime Minister Laptop Scheme.